It's so hard to believe D is now 2 1/2 Years old! Where have the past 2 1/2 years went? 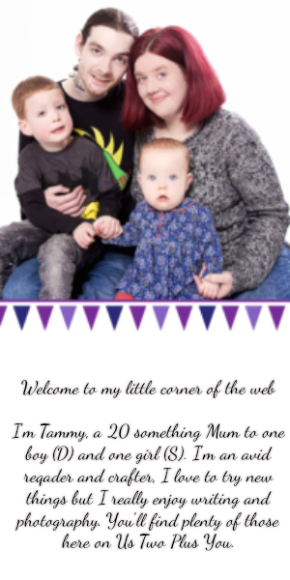 We have a lot to update you on this month, D has progressed so much since we last did a post. With Uncle L moving in, Moving house, adapting a new routine, a new room, new bed and everything in between! D has been growing and learning everyday, his words, sentences and all round speech is getting better and better. We have found D loves to learn, he is so enthusiastic about trying to say new things and learning new sounds. In the past few months D has learnt to recognise and say most sounds made from vehicles, animals and the weather! D's favourite sound is NEE-NAR, he loves to be a police man in a police car with his police hat on! D has also developed a very good imagination and will regularly be found making his toys talk, hug, run, jump and sing! He likes to take his police cars off to stop the dinosaurs fighting with each other! This one in particular is very amusing to watch as the police man is 3x the size of the dinosaur and the police car he uses, but the dinosaurs are very defiant and like to say no, this always ends in them arguing yes, no, yes, no, yes, no followed promptly by the police man going ahhhhhhh!!! while the dinosaur eats him!! D likes to play with his dressing up hats and to also dress up as mummy in my high heels and scarfs along with sunglasses and daddy with his hat, slippers and daddy's necklace. D is becoming very interested in trying to write things down like our shopping lists, he will sit beside me with his own piece of paper while he tries to copy what i am writing on mine! He now recognises almost every letter and sound and has learnt to associate the letters with things and will try to say the letter he thinks words start with although he is still mostly wrong this is a huge leap from struggling to say some letters and their sounds! D has changed a lot in his personality, he loves to laugh at anything funny! 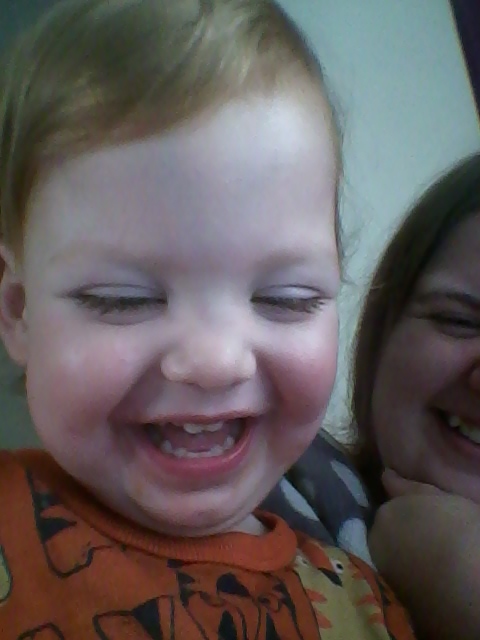 He finds daddy very funny and will always find a reason to laugh at him or with him. If you listen while he is playing alone he will regularly crack himself up! D also loves to be independent but very safe at the same time, he knows when he can cross a road and when he cannot. D has learnt about the area of the house that can be dangerous and will always be VERY careful around these areas all except the stairs (not sure he understands the stair one?). He will be very careful when in the kitchen, bathroom when the floor is wet and doesn't go under the stairs, he also doesn't go into the cupboard in his room! We finally learnt to get his top on by himself! He can now get himself dressed and will regularly take it all off just to put it back on! we are still working on socks but they really are hard! While we where moving house D became a perfect little handy man! 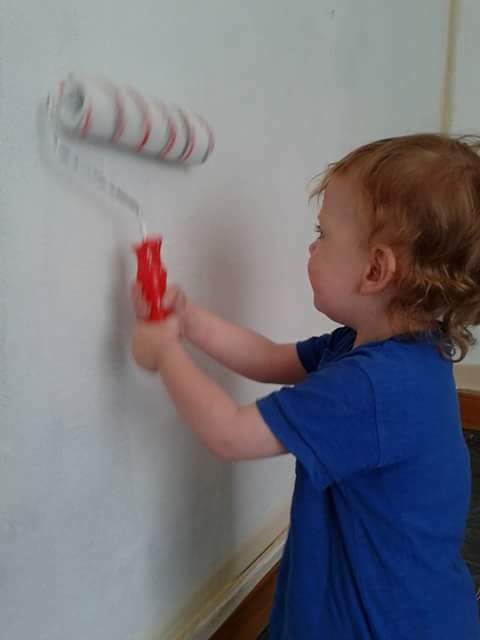 He loves to use his little rollers to paint pictures or pretend to paint the wall with unused rollers! He also loves it when daddy had to use the drill to make a hole and will become daddies "boss" telling him where it has to go for the hole to drill right! He has also loved using a screw driver to put all the screws in right and I think we will be asking Santa for a builder's bench this year! I think from now on we will be doing our D at... posts on a 3 month basis from now on rather than every month like before as we will have so much more to tell you!